Developed by the University of Richmond’s Digital Scholarship Lab and released in December 2017, Renewing Inequality is an interactive, online project that maps the demographic profiles and footprints of thousands of urban renewal projects between 1950 and 1966. Using such resources as the federal government’s Urban Renewal Project Characteristics, Renewing Inequality reveals the sweeping scope of urban renewal, which razed entire neighborhoods during the era, as well as the disproportionate impact they had on the country’s African-American communities. Renewing Inequality follows an earlier project released by the Digital Scholarship Lab in 2016, called Mapping Inequality, which details neighborhoods deemed too risky for investment and set on a course of institutionalized neglect and decay. Actively fueling the process of decay was the policy of redlining, which in effect barred communities of color from seeking mortgages or financing to repair their properties. With a cycle of decay institutionalized, these same neighborhoods were prime targets for urban renewal. 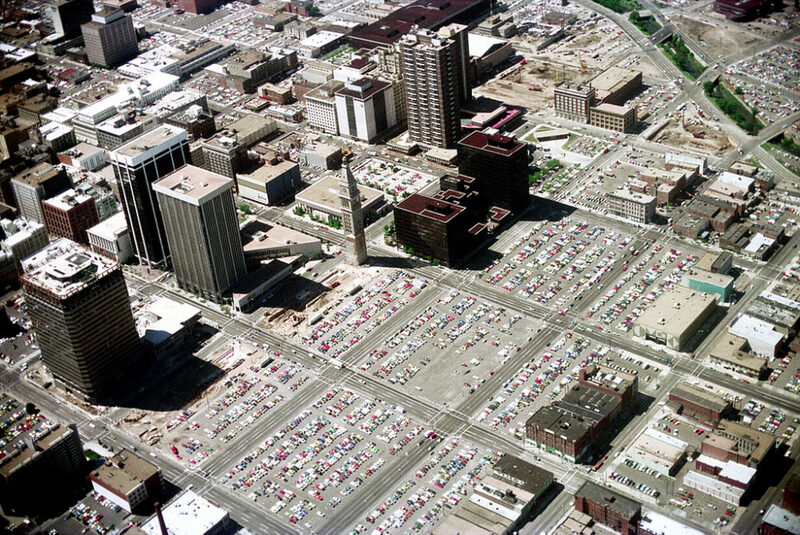 Beginning in the 1950s, the federal government actively reshaped American cities through urban renewal, based on then-contemporary priorities in use zoning, residential density, automobile usage and highway construction. Equipped with billions of dollars in federal funding, local governments applied eminent domain to displace hundreds of thousands of families across the country, deeming long-standing neighborhoods as “blighted” land unfit for habitation. Ostensibly, relocation assistance and public housing were meant to follow “slum clearance” but in many circumstances, relocation funding or housing never materialized. Not only were homeowners forced into becoming renters, but much of the compensation given in exchange for eminent domain seizure was based on undervaluations of those properties. 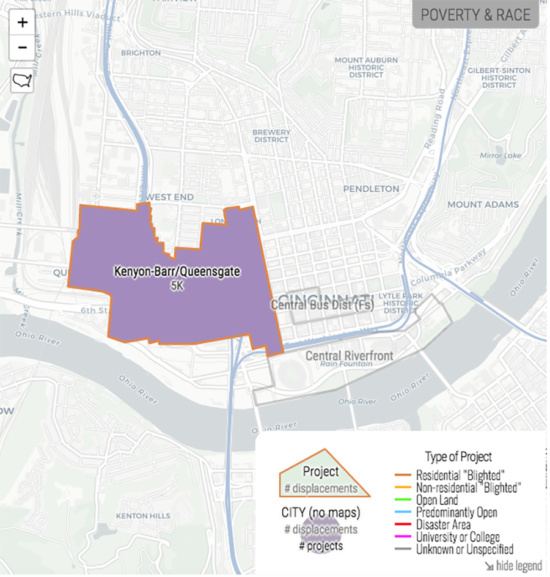 For example, the Digital Scholarship Lab highlights Cincinnati’s Kenyon-Barr/Queensgate as the largest urban renewal project in national history, displacing approximately 5,000 families. 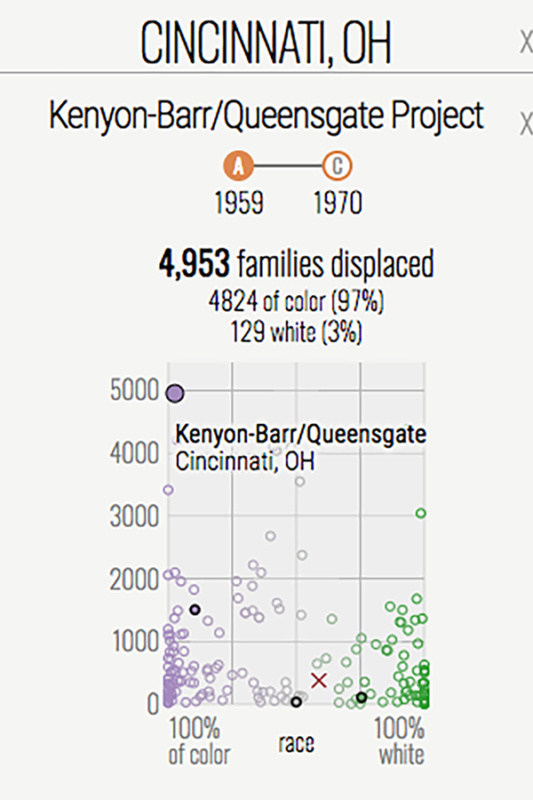 The map highlights that approximately 97 percent of those displaced were people of color, and also reveals that this predominantly minority community was adjacent to Cincinnati’s Central Business District, a focal point for white, suburban office workers–a trend in the displacement taking place in a number of American cities. As noted by the Digital Scholarship Lab, the land seized from many of the impacted African American neighborhoods “was re-purposed for commercial or industrial development or to make way for highways,” an act of “intergenerational wealth theft that helped shape today’s profound inequality” along racial lines. While the wholesale demolition of inner-city neighborhoods is much more uncommon today, large swaths of historic housing stock are currently being razed under the guise of alleviating housing pressure. However, as noted by CityLab, urban areas of older, mid-size housing boast greater affordability and employment opportunities than their modern counterparts, limited as they are by contemporary zoning and uses. It seems we still have a lot to learn from the lessons of urban renewal.